A responsive website for Visit Buckinghamshire. We provided Workshops, Design strategy, User experience strategy, Responsive UI design, Website styleguide, Quality Assurance. The website enables businesses to advertise their business, list events and offers and aides tourists and visitors with the discovery. 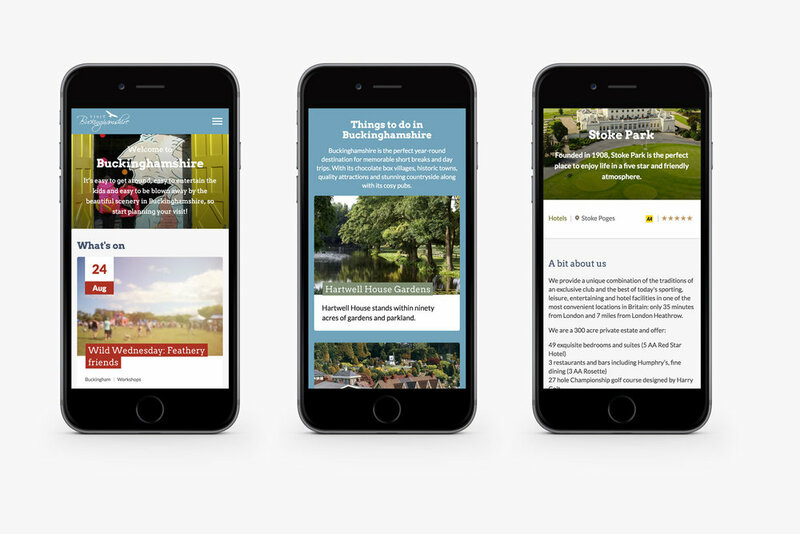 After our successful work on Buckinghamshire Business First's website, Visit Buckinghamshire came to us with the task of drastically improving their existing leisure and tourism site. The website enables businesses to advertise their business, list events and offers and aides tourists and visitors with the discovery of new things to do. The new website had to meet a variety of different user needs from business owners through to day-trippers. The site had to be responsive to multiple device formats and allow for quick and easy navigation. Visit Buckinghamshire were no longer creating their printed brochure and their online presence needed an overhaul. Working to a tight budget and timeframe, we started with a series of collaborative workshops. We were able to quickly define an appropriate user experience that met the different business and user needs. As part of the new package for local tourism businesses, we provided the ability to create profiles where local businesses could create events, share imagery, deals and activities easily. We expanded the existing brand guidelines to incorporate digital paradigms. The overarching look and feel compliments the desire to showcase Buckinghamshire as an all-round destination, aid discovery and put all the great things to do at the centre of the new Visit Buckinghamshire website. The use of large imagery and easy access contact details make planning a visit a breeze. The development of the website was in collaboration with our friends at Shed who led the technical development of the new platform. The fully responsive site was completed on time and on budget. Within the first week businesses started creating their profiles. Positive feedback on the new site and it's feature-set was received from their business membership base.